If you’re reading this, you know that Facebook is important for growing your online store. You also know that the only way to build a following on social media is to regularly share engaging content. When you run a small business, you never have enough time for your social media content plan. 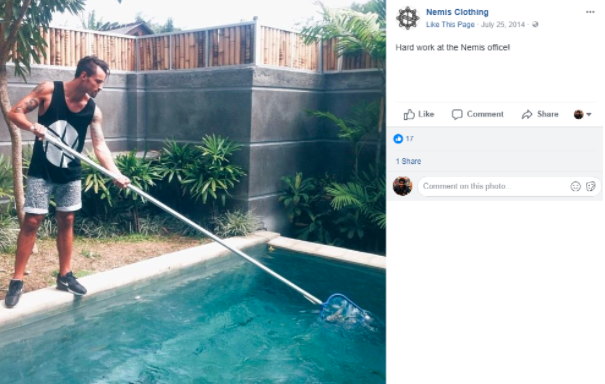 We’ve got you covered: here’s a backup list of 20 Facebook post ideas for your business page that will work for most stores. Behind the scenes pictures and videos always work well. If you can’t think of new Facebook post ideas, take shots of your employees, partners, and stakeholders who run the business. Your customers will like the fact that there are real people running your store, and your business is not just a faceless corporation. 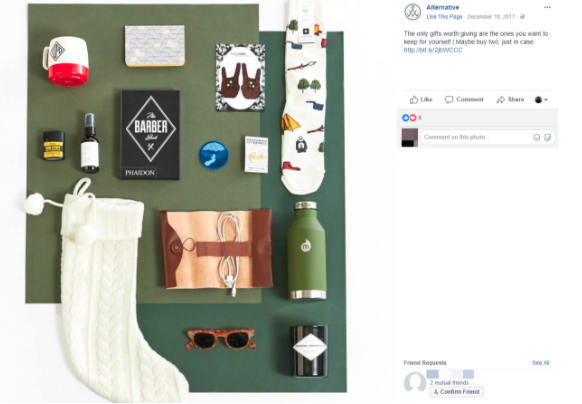 Product pictures will obviously be a staple of your social media content. Instead of the standard product-against-white-background shot, try sharing more stylized product images. Taking a quality product picture requires some effort. At least, learn a couple of simple product photography tricks and how to change the background on your pictures without using Photoshop. If you sell visual products, learn to have a reserve folder with product photography, and take new photos regularly — even if you’re not going to update your storefront photography right away. Get the habit of having one of your products on you all the time. This way, you’ll be able to take a picture using your phone if you spot a beautiful location or meet a perfect model (among your friends, for example). 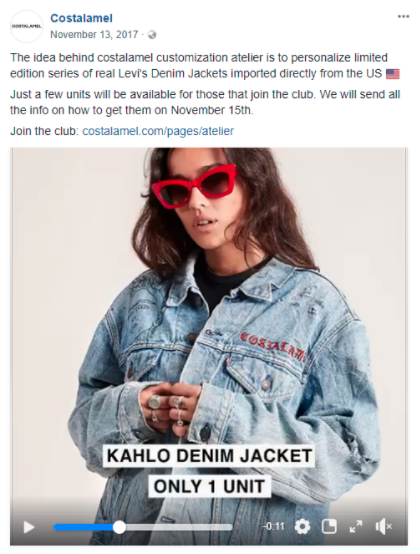 For a consumer-facing retailer, particularly in the fashion segment, stylized pictures of models using their products will form a staple of any marketing campaign. While professionally shot pictures of models do a great job of showing off your products, they can feel a bit distant and inorganic, especially on social media. Combine them with images of real people. The context in which customers see your products on Facebook will often impact how they perceive them. If your product is placed in a collection next to top luxury brands, you are indirectly telling customers that your product is luxurious as well. Try to create collections where you combine products from different brands. Your goal is to get customers to associate your brand with certain styles, movements, audiences, or emotions. The next one on the list of Facebook post ideas is sharing pictures that follow the same theme, design, or style. By doing that, you can shape how customers see your brand and its aesthetic. 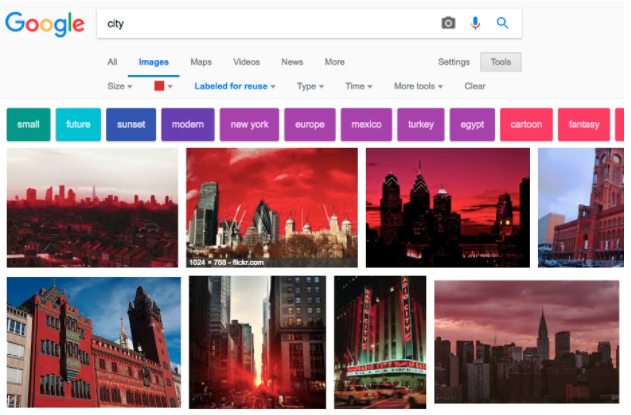 Aloye regularly shares images organized around a single color. By itself, each image might not look like much. When seen alongside others, however, it creates a distinct brand identity. One of the best ways to build social proof is to show real customers wearing your products. If you take this route, make sure you ask customers for permission before sharing their pictures. Most will not only grant you permission but will even tell their friends that they have been featured by a brand, bringing you additional traffic. 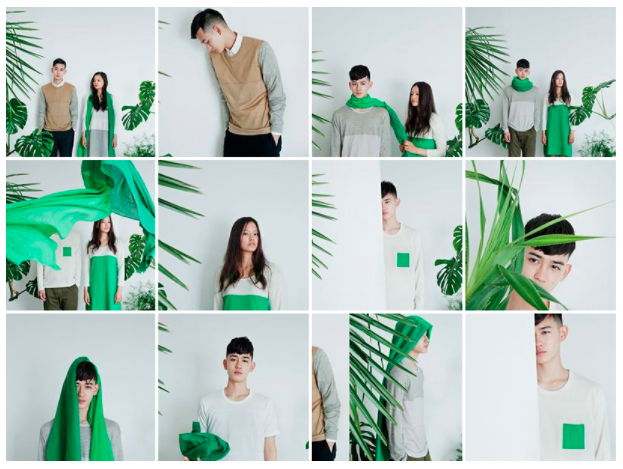 The clothing brand Monrow regularly shares pictures of its customers wearing its outfits. Mostly, these are reblogged from Instagram. Tip: create your branded hashtag and promote it across social media to get a steady stream of user-generated posts. Sharing live Facebook videos of your products, Q&A sessions, design sessions, etc. should be a big part of your customer engagement strategy. Align yourself with a trend and get additional traffic by posting something related to a popular hashtag. This tactic is particularly effective if the hashtag has values you want customers to associate with your brand. 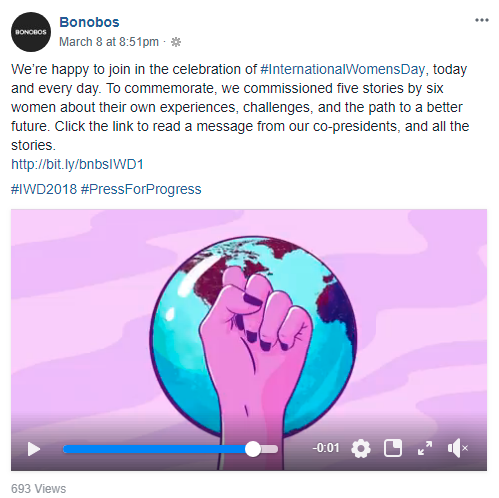 Bonobos shared this short video to celebrate International Women’s Day. Not only does this help it get traffic from people searching for this hashtag, it also portrays Bonobos as a progressive brand. If you have any discounts, deals, and sales coming up, make sure to tell your Facebook audience about them in advance. You can even share sale previews or give followers additional discounts. 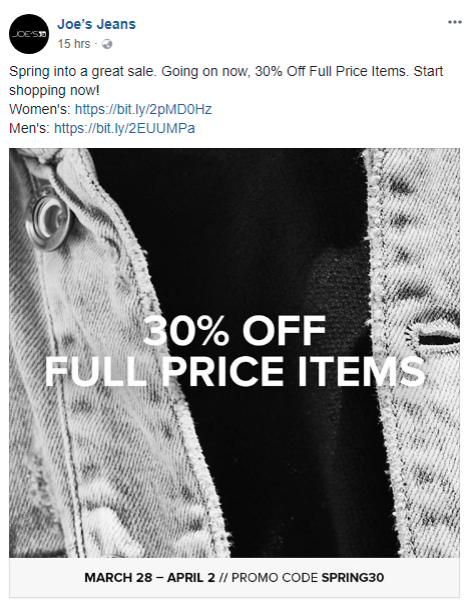 Joe’s Jeans regularly updates its followers about upcoming sales. It also uses a Facebook-only promo code to give its followers a bonus for their loyalty. In some niches, such as activewear and athletic gear, you want customers to associate your brand with certain activities and lifestyles. Sharing pictures and videos of people doing those activities can help in brand building. Not only are such shots great to look at; they also help customers associate your brand with a certain lifestyle. When you lack Facebook post ideas, browse free photo stocks and Pinterest for inspiration. Do you have an upcoming product(s) that you want to build up customer interest for? Instead of sharing an image, create a short video preview telling customers about the product. The fashion brand Costalmel shared a video showing off one of its limited edition products. Since videos are more visually interesting than static images, such previews will likely get more engagement than your regular updates. This can be an advantage in case you want to promote a particular product heavily. Tip: A cinemagraph (“live” photo) can work equally great here. If you’re short for resources to make a video, create a cinemagraph and share it in a Facebook post. Your Facebook page doesn’t have to be all about you and your products. Break up the monotony by sharing memes, quotes, and images unrelated to your business. 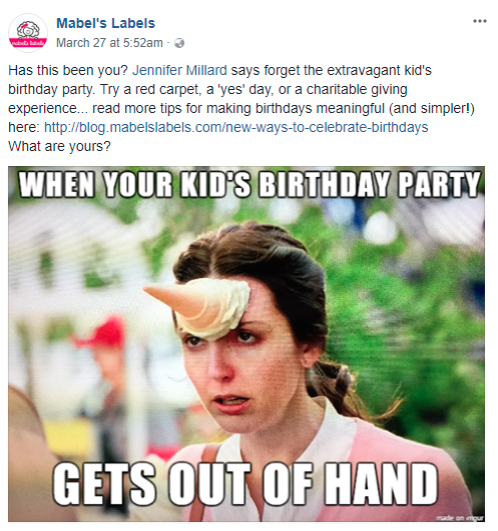 Do you have any well-known celebrities as your customers? Have they ever used your products while out in public? Sharing pictures of such customers can be a goldmine of social proof. Lafayette 148 New York, an NYC-based luxury label, had the distinction of having Oprah Winfrey as one of its customers. 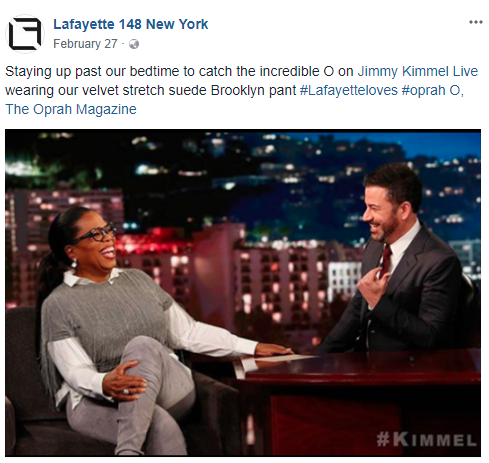 So when Oprah made a public appearance wearing one of its clothes, Lafayette 148 wasted no time in telling its Facebook audience about it. Well, if getting someone like Oprah to use your products sounds as realistic as meeting a unicorn, don’t get upset. You can reach out to local micro-influencers and offer them free samples of your products in exchange for a photo. Did you know that you can build a store on Facebook and share product listings with your audience? Instead of simply sharing static images, go dynamic by also giving customers an easy way to buy your products. All you need to do is create a Facebook store and list your products. 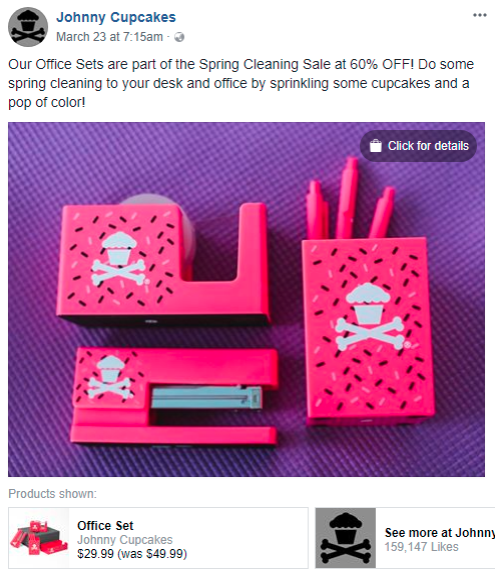 Johnny Cupcakes regularly shares professionally shot pictures of its products. Along with pictures, it also shares links to the listings to make purchases easier. Tip: to tag a product on your picture, upload it on Facebook, click tag products and click the area where your product is shown. Then enter the product title or ID. Save the chages. Do you have an upcoming pop-up shop in the city? Are you hosting a charity night to promote your brand? Experiential marketing is another hot e-commerce trend. In crowded markets, giving customers a chance to see, feel, and interact with your brand can help you stand out. Set up a regularly updated events page where you can notify your followers about upcoming events. 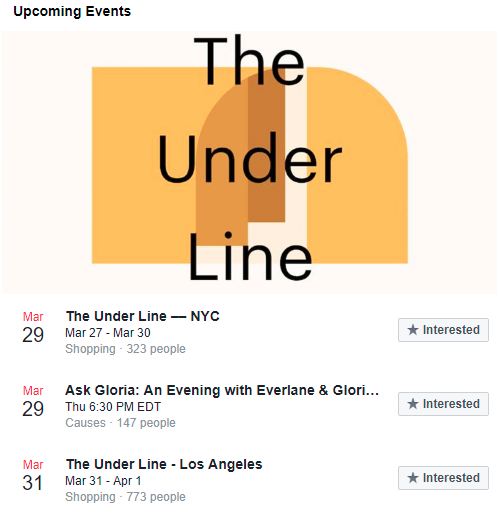 Everlane, a popular women’s fashion retailer, has a number of events organized around shopping and causes. Followers can see all of them on its Facebook page and decide which ones they want to attend. One of the problems with sharing videos and images is that they tend to be non-interactive — unless you ask a question. Solve this problem by turning your content into questions and polls. You can either host these polls in your Facebook posts or drive people off-site to your own self-hosted polls. Tip: If your audience is a bit too shy to answer the questions, add a numbered list of answers to the post and ask them to post the number in comments. This way, they won’t have to think of their own comment. Contests and giveaways are a staple of social media marketing and for good reason. They are interactive, attract new customers, and have a tendency to go viral. Once in a while, run a contest or a giveaway on your Facebook page. Choose a reward they’d actually want (usually something from your product catalog), and give them an incentive to share it with their friends. User-generated content (UGC) is a proven way to build up social proof. When others see real customers using and loving your products, they’re more likely to trust your offerings. Try to curate all UGC by asking customers to share it using a custom hashtag. You can then search for this hashtag to find all customer-created content and share it on your page. 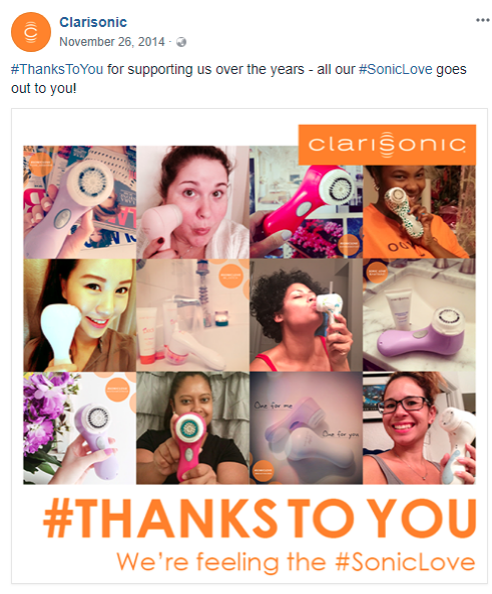 For example, Clarisonic asks customers to share their pictures using the #SonicLove hashtag. It then compiles their pictures into a single image to thank them while also building social proof. We’ve seen that UGC, giveaways, and content focused around trending hashtags make for great Facebook posts. However, you don’t have to use any of these in isolation. You can combine them as you see fit to create posts with viral potential. 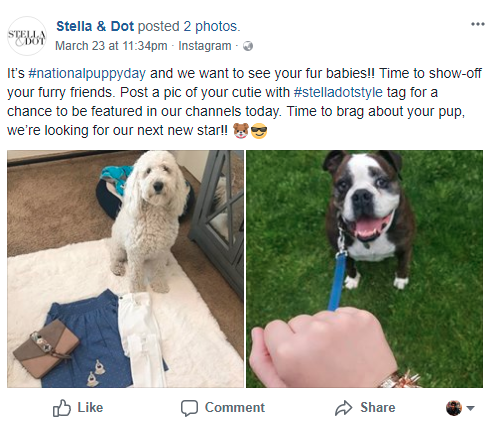 Stella & Dot, a clothing label, used the #NationalPuppyDay hashtag to ask its followers to share pictures of their pets. A selected winner was then featured on the site and offered a gift voucher. This is a perfect example of leveraging different content formats to create viral content. The #NationalPuppyDay hashtag was a great excuse to curate one of the most popular content types on social media — pictures of dogs. Throw in the contest element and you have a post that can easily go viral. Millennial customers have regularly shown that they prefer a brand that aligns itself strongly with a charity or a cause. Use this to your advantage by sharing content related to a cause or an important event. If you’re going to use this tactic, make sure to be genuine and classy. Customers shouldn’t feel that you’re just using the charity as an excuse to make money. Facebook is a vast and open-ended playground for businesses. From memes and product pictures to event updates and live videos, there are countless post-types you can share with your followers. Whenever you’re feeling uninspired and need some fresh ideas, use this list as a guide when creating content for your Facebook business page. What content works best for your business on Facebook? Share with us below!